Most of the Bitcoin exchanges accept many payment options, with the exception of credit/debit cards. One reason for this is because of the irreversible nature of Bitcoin. However, there are many legit Bitcoin exchanges that have started accepting credit & debit cards as a payment method. 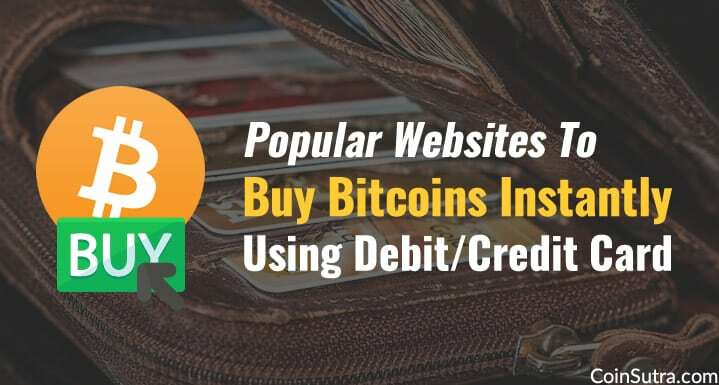 Here are some of the popular & legit Bitcoin websites where you can use your debit or credit card to buy bitcoins. I have tested these all myself. I used my travel card (prepaid USD card) to purchase bitcoins on Cex.io & it worked like a charm. When you have verified your account, go to the “Cards” section & add your cards. It may take 2-3 days for card verification, but once it’s verified, you can use it to instantly purchase bitcoins. Along with BTC, you can also buy ETH (Ethereum) using your credit/debit card. Bitit is a France based Bitcoin company that is selling popular cryptocurrencies including BTC. And they proudly claim to be the easiest place to get started with cryptocurrencies and I too believe so because they are selling cryptos in exchange of more than 10 fiat currencies. Also, one can use their service for buying bitcoin from credit/debit cards instantly as they support Visa, MasterCard, American Express, & Maestro powered debit/credit cards. Purchase up to 2500€/week by cash voucher, e-wallet or direct banking. CoinBase is one of the most popular websites to purchase Bitcoin, Litecoin & ETH. They also support purchasing Bitcoins using Visa debit/credit card & the process is instant. This feature is available to you only if you are from the USA. If are from any other country, you should look at other options listed here. Go to Payment settings page & click on Add payment method. Select card & add debit/credit card. Login to your card statement account & notice the small transaction amount. 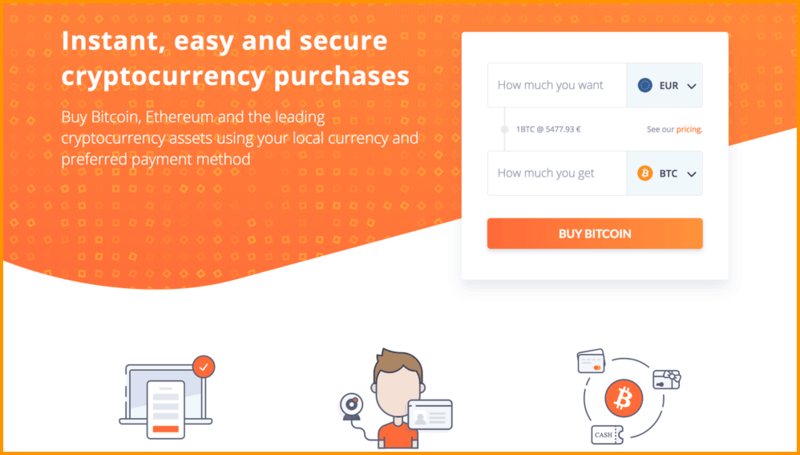 Coinmama is another site where you can use your Credit or debit card to purchase Bitcoins instantly. 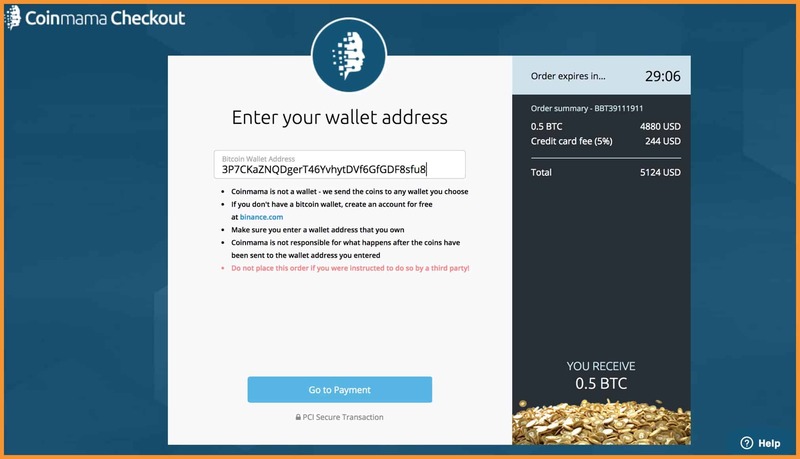 Unlike other sites, CoinMama doesn’t offer Bitcoin wallet & you need to add your Bitcoin Wallet address on which you want to receive Bitcoins. I found the price of Bitcoins to be higher here in comparison to CEX.io. However, this is another option that you should keep when you need to buy Bitcoins immediately. Wirex is providing a complete crypto banking solution for UK residents and much more. Using Wirex you can buy Bitcoin easily. When you register on Wirex and complete you KYC you get access to a crypto linked bank account. Here you can top-up your account with a debit/credit card and use this top-up to buy BTC anytime. If you are someone looking for a complete banking solution, Wirex is the way to go as they have their physical cards to available for the UK. 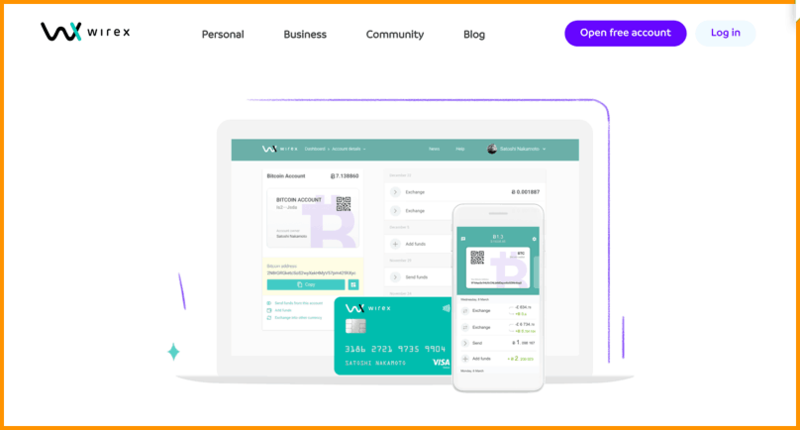 Here is the deal from CoinSutra: Wirex Deal: Free Virtual and Physical Bitcoin Debit Card. I will keep updating this exclusive list of sites that allow purchasing bitcoins using a credit & debit card. For now, it’s your turn to recommend any site that accepts credit or debit card as a payment method for bitcoins. Do let us know in the comments section below. Thanks, Harsh Agrawal. You really help me in choosing best debit / credit card. Which is best website to buy bitcoins using debit card Bec CEX.io is very expensive, plz reply me soon bro I am from India. Harsh, I signed up on BTCC but they were asking for my passport details for verification. I am bit apprehensive about sharing my passport details with them. Did you share your passport details with them ? I have used these websites to buy bitcoins using Debit card. They seem to be charging very high charges for the Card transactions. More or less the end prices are similar to those of Indian Exchanges. These websites also have options of International Wire Transfer options. But none of the Indian banks like ICICI, Axis, HDFC etc were ready to approve Wire Transfer for Bitcoin/Ether purchase. Any suggestions on how I can buy bitcoins for cheaper on these websites? What about charges on Debit/Credit card V/s Wire transfers. i registered on CEX.io and for cards they are charging 3% + .25 cents. Whereas wire transfer nill charge. I prefer to store my BTC in bitcoincore. Which one is having least transaction charges in this list? Any suggestions or review about bitcoin panda? I found Bitcoin panda price to be high. Regarding wallet, if you are a techie guy & you can use BItcoin core wallet, then its good. Hi I would like to know if it is cheaper to buy from the above sites mentioned rather than buying from Indian sites like Zebpay. Is there any benefit in doing so as I see there is a just marginal benefit due to exchange rates. It keeps varying depending upon Indian inventory. Sometimes its cheaper therefore always compare before buying. That’s very imperative to know. Thanks @Agrawal for sharing such info. It really makes individuals aware about what to choose or what to not. Thank you for all the great info. My question is I am a US citizen living in Colombia, I have a US credit card, but I am having a problem getting verified. Colombia does not support bitcoin. Any help would be greatly appreciated. Coinbase was the first one i tried, and they told me that i needed to be a resident of the US. I have just got verified with CEX.IO but they seen a bit expensive? any other ideas. Thanks in advance. Thanks for this great Info Harsh. I am residing in Saudi Arabia. Do these websites allow people from Saudi Arabia to buy/sell/trade bitcoins? Muneer that you need to check on these websites. I would suggest start with CEX which worked for me when nothing else was working. waiting for your reply, any help would be appreciated. I used ICICI bank debit + travel card (USD) and both worked without any issue. Your blogs are very informative. Can you please also suggest exchange outside India where I can buy altcoins (primarily LTC) using indian debit/credit cards. I went through exchange mentioned in the link above but they do not accept Debit/Credit cards if one is Indian resident. CEX and CoinMama works flawlessly. I was using Citi Bank CC and was working fine. I am not able to purchase now and bank says you cannot do this transactions. Any clue that which bank allows to buy on these site. Never heard of this before! Did you tried CEX.io and BitStamp! City Bank CC card is not working on both sites now. But I can use HDFC CC on CEX. But it is very expensive …. I am user of CEX and purchased btc from CEX many times by HDFC card but now they don’t allow it so i open other account in ICICI but same thing here so can you please have any idea about it . Hi, Harsh sir, Is there any documents required for buying Bitcoin such as a driving license? Depends where are you buying from. From the exchanges listed above, you definitely need some kind of proof. The benefit is the trust here. However, you can also buy from other places anonymously but then you are of your own on such places. Any limits on USD amount for buying bitcoins from foreign exchanges? All exchanges have different limits. You need to get in and see what they are as they keep on changing those limits!! Why would we give them our debit or credit card details? Giving our proof of ID and address is okay. But a photo with a credit card details…?!? total garbage. I’m not telling that CEX is scam or suspicious, but giving your payment details to someone else is absolutely not safe. I used to purchase btc from coinmama using my HDFC debit card. But since a couple of days, neither my credit nor my debit card works for purchase. HDFC is refusing the transaction. Did anyone else observe this recent development? Hi there! Linkkoin.com is giving 5$ in crypto for registration. Check it out!